Something has been bothering me, for a couple of years now, and I finally started getting what it was the other day. It has been a widespread acceptance of a behavior I’ll call the “inner victim.” This often unconscious phenomenon allows the individual to complain about many things, incessantly, yet not thinking they are acting like a helpless victim. Complaining about something you aren’t doing anything to change is the action of a victim. When I allow myself to be disgruntled or aggravated about some situation or person and take no action to change it I’m guilty of self-abuse. I’m causing myself harm by harboring these feelings. This is not healthy. When I do something about the undesirable or unwanted situation I am being an activist. I am in action about something I feel strongly about. This seems much healthier to me. Part of what has bothered me is the way friends and colleagues of mine – most of whom consider themselves to be pretty conscious – converse socially in this mode of complaint or victim. Whether it is about traffic, the homeless or their neighbor on a local level or climate change, deforestation or politics on a larger scale. The tone of their voice is different. I’m starting to detect a whining when I’m around one of these people complaining about this or that. I also am noticing how contagious this behavior is. 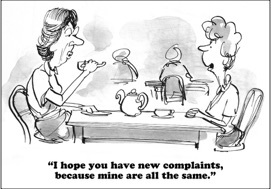 One person starts the ball rolling and others feel moved to chime in and join the complaining party, sometimes adding another subject like, “you think that’s bad, you should see….” or giving another example to underline the righteousness of the first complainant. For some unfortunate reason, complaining, rejecting, or fearing something strengthens your sense of ego and makes you feel like you’re important. You contract back into your small and false self, and from there, unfortunately, it becomes harder and harder to reemerge. 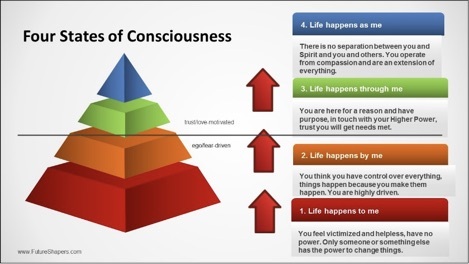 In our FutureShapers model of the four states of consciousness, victim is the lowest state, at the base of the pyramid. It is shown on the graphic below as “1. Life Happens to Me” in red. In this model, to make the transition upwards from one state to the next highest state, one must give up something they are holding on to. In the case of transcending the victim state, one must give up blame. Victims have scapegoats – people or situations they blame for their situation. It is never the fault of the victim; it always the fault of someone or something else. This is in stark opposition to the way conscious leadership is defined by the Conscious Leadership Group (“CLG”) who equate it with taking responsibility for your influence in the world. I recall an email exchange I had with one of CLG’s partners, Diana Chapman. I had made a request of her and after sending her several reminders she replied that “she had distracted herself” and failed to respond to me. I had never heard anyone address distraction so responsibly! Usually, people say something like “this or that distracted me” like it was the fault of “this or that.” I found her ownership of her responsibility for being distracted to be a fresh exception to the conventional “excuse” most of us use so widely. Many of us have grown used to this way of relating to one another. We’ve grown up doing it and it has become ingrained in us, like talking about sports or movies we’ve seen recently. So next time you either initiate a conversation or join one, ask yourself if the context for the interaction is one of victimhood. If complaining about anything is part of the conversation you can be sure it is. A second question to ask yourself is whether this complaining is going to have any positive effect in rectifying the situation being complained about. If the answer is “no” then you and the other people involved in the conversation are simply “dumping” on one another, engaged in a conspiracy of negativity that is certainly not uplifting or generative. Ask yourself why you are having this conversation. Are you enjoying it? Does complaining make you feel better or “important” as Rohr suggests above. Is having victim conversations simply a habit and, if so, do you want to break it? If you want to break this habit, what steps will you take to do that? Will you ask your friends to remind you and call your attention to it whenever you do it again? Will you ask them not to have such conversations in your presence in the future? Getting out of victim mode is healthy, conscious and serves the world better. It also allows former victims to live much more powerful lives, be more creative and, frankly, more fun to be around.